For the painting “Lovers of Solovyov” Makovsky received the title of academician. She was exhibited in Vienna and immediately received praise. The canvas depicts three men who are in a small wooden hut. On the table there is a bottle of moonshine, probably the friends stayed up until the morning for long conversations, not paying attention to the fact that dawn had come. The dishes have not yet been removed; a huge boiling samovar is located near it. All the attention of men drawn to the bird, located in a cage that hangs over the table. With the rising of the sun, she began to sing, forcing her friends to hear a wonderful, ringing trill. Their faces depict the pleasure and delight that they experience while enjoying the beautiful morning song of the nightingale. They were conquered by the sensitive poetry of nature, embodied in the image of a bird. The artist wanted to show the sensitivity and receptivity of the souls of ordinary peasants, who, despite their rudeness and severity, are able to notice and appreciate the beautiful. The owner of the house, sitting against the wall, gently smiles. Opposite him was located the shopkeeper, who, despite his seriousness and tidiness, also stood in silent ecstasy. Near the table is a retired soldier, who turned his attention to the cell. The purpose of the artist was to make it clear that even the most ordinary people involved in domestic affairs, find true beauty where it would seem difficult to notice. Their faces are riddled with wrinkles, but this does not prevent them from being imbued with love for Russian nature, become part of its sacrament, and humbly admire fleeting moments that carry true happiness. These men have a subtle nature that allows you to catch the most sensitive moments and hear the call of nature, which resulted in the delightful singing of a nightingale. 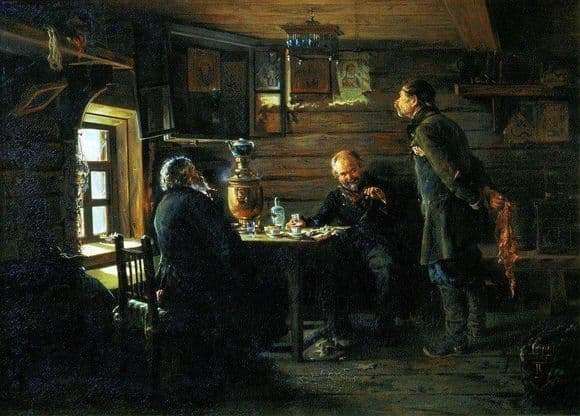 This work is compared with the stories of Turgenev, reflecting an understanding of the character of the Russian person.